I love this outfit! That fur is so cute! What an adorable outfit! I love your vest and skirted leggings! Classy and chic look! I love it! 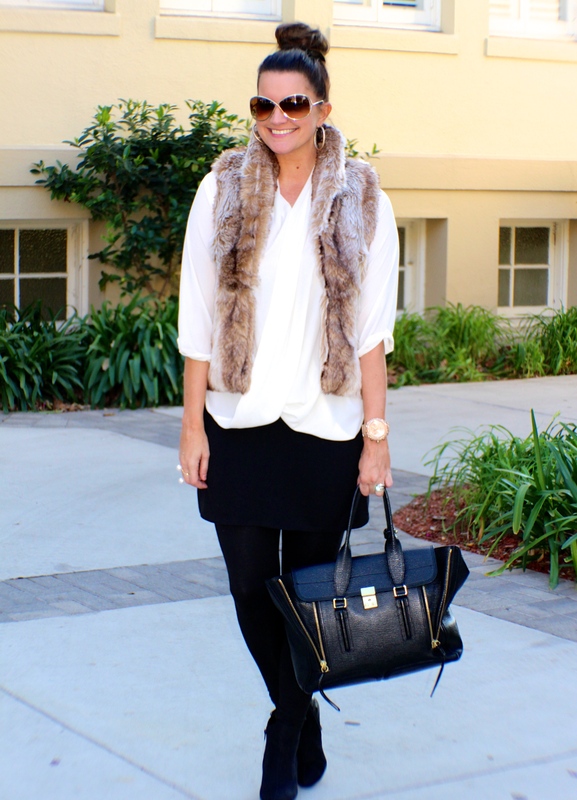 B/w combo is perfect and those fur vest make it more luxurious! These pieces are all wardrobe essentials and look fabulous when paired together. You look beautiful and I’m lusting after your Philip Lim purse! 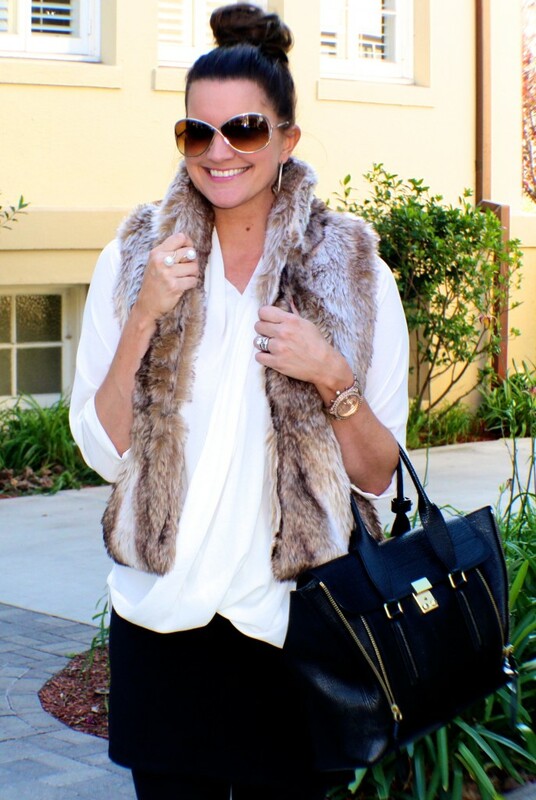 You look gorgeous, love this faux fur vest! Great combo, you look super chic! You look beautiful! Love the fur vest! Loving your cute top knot and what a gorgeous bag, babe! You have such amazing style! Love the watch and purse! Classics are a must! Love the outfit!! The lady likes her fur and she looks fabulous in it! Seriously, love that vest and your blouse has the perfect drape to it. Beautiful look! What a chic outfit! 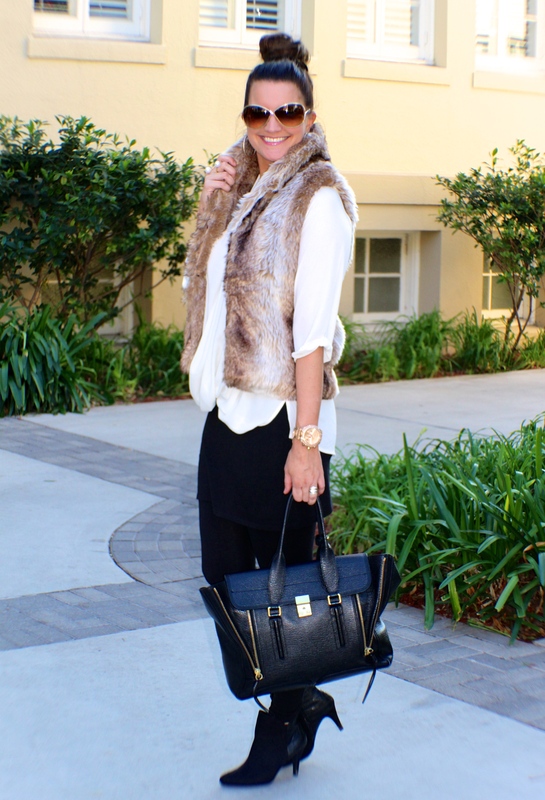 I am loving that draping blouse and the faux fur vest looks fantastic with it! Your bag!!! I LOVE it! and this fur vest is so perfect on you. Fabulous outfit! I agree that the faux fur vest has become a must have item. You look stunning! And congratulations on your new site! Looks great, Hon! Loving it! This look is so classy with a twist of trendy! You look stunning! Beautiful smile! I love your take on the classics – anything that works for your life and can be remixed to no end should be a classic! Those sunglasses are perfect on you! Love the outfit, of course, too! Love your vest and I agree these are all such classic pieces!! Hello pretty lady! I saw this vest at Forever 21 and was contemplating it! Totally love how you styled it and how it looks on you! Such a great outfit! 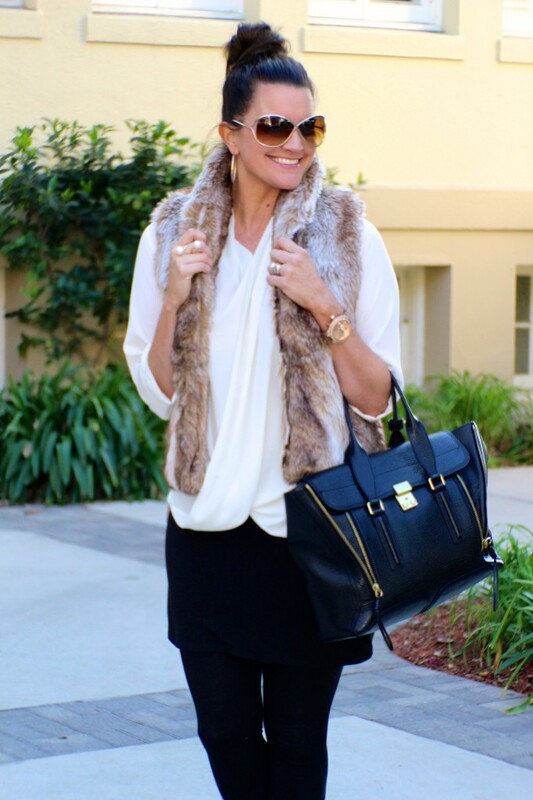 Really love your fur vest and the bag! Gorgeous look! Love the vest! Super cute! you look adorable! love that white top!! You definitely know how to accessorize on a cold day! Cute outfit. Such a classy look! I’m loving it! I really need to find a faux fur vest! I love this classic look. So simple and classic — love it! you look great! I’m loving this outfit! Cozy classics indeed! This is such a great chic outfit – and so easy to replicate (thank you classic wardrobe staples). Gorgeous! Your vest is SO cute, ahhh I want a cute one like that! And I’m obsessed with your bag. totally agree with your must haves! this is such a great, classic look. I really love the drapiness of the shirt, it’s so pretty! Oh I wore a faux vest today, I wear it over my coat as it is not quite warm enough. You look great in yours!